Macedonian RK Metalurg Skopje are now the only team without a single point in the VELUX EHF Champions League. Swedish best side Alingsas HK gave revenge to the closest rival in the group, Turkish champions Besiktas Mogaz 27:24 (14:12). Even more important thing is that Swedes overcame the rival’s advantage from the first match in Istanbul (26:24) in Istanbul six days ago, which means that Alingsas will be ahead of the Turks if both teams ended Preliminary Round with the same number of points. A small surprise has been seen in Schaffhausen. 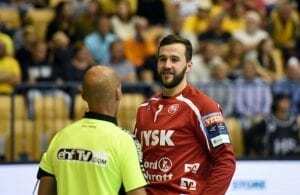 Ukrainian best side Motor Zaporozhye showed how dangerous they could be as visitors by beating Kadetten Schaffhausen 37:32 (18:14) in BBC Arena, after home win in Kiev 31:26 last weekend. Burka, Stochl and Co. are now on four points with solid chances to finish the Preliminary round on spot which will take them to the TOP 16. Next Story → HBC Nantes deny Maqueda transfer to RK Vardar Skopje!